Ideal for indoor, personal spaces, Havells range of personal coolers is a comforting solution for scorching summers. These personal coolers are aesthetically designed to harmonize well with your interiors. Made using the Breatheezee Technology TM, the coolers abide by the brand’s notion regarding air purification system and cleaner technologies. Havells Personal Coolers, besides proving cleaner and breathable air, comprise of remote control, collapsible louvers, honeycomb cooling pads, auto drain facility, humidity control, temperature display, inverter compatibility, thermal overload protection, ice chamber and much more, to offer complete peace of mind when it’s about safety, convenience and portability. 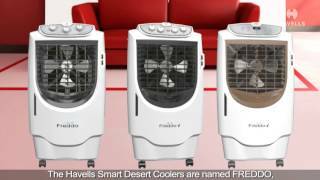 Enjoy amazing air delivery with personal coolers from Havells! Ideal for domestic usage, these personal coolers are equipped with water level indicator and adjustable humidity control for superior cooling solutions. India's first innovative air cooler with completely collapsible louvers, washable dust filter net, water tank cover, auto drain, humidity control, temperature display, cord winding station, honeycomb cooling pad & low noise.